Beat the eggs, gradually adding the honey. Add half of the milk and the melted coconut oil to the egg mixture and combine thoroughly. Mix the cake flour, baking powder and salt, and add to the egg mixture. Gradually mix in the remaining milk to form a smooth batter. Cover the mixture with a kitchen towel and let set for approximately 30 minutes. Drop batter onto a heated greased nonstick pan, turn once the top is full of breaking air bubbles; cook on the other side until golden brown. 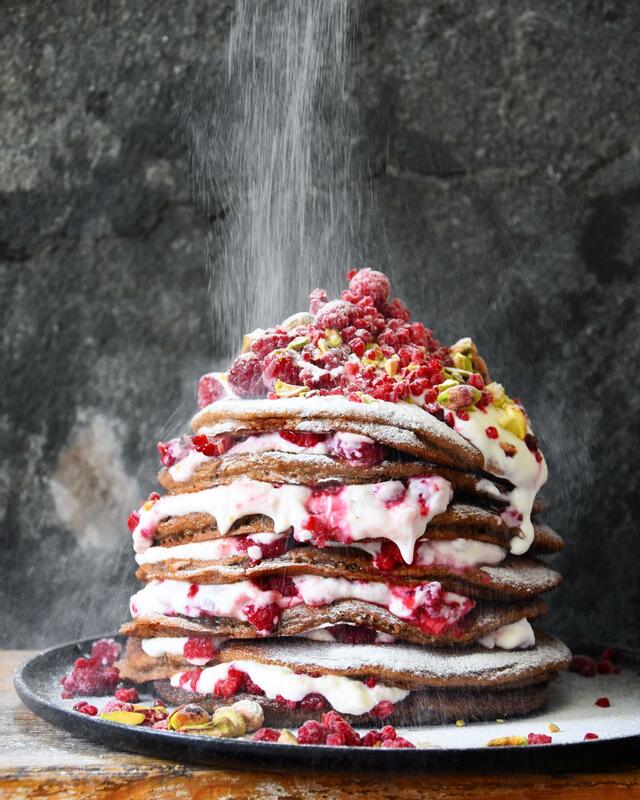 Serve the pancakes with a dollop of quark, a generous handful of frozen raspberry, pistachios and optionally icing sugar.